Containing about one-third of the world’s coastal old-growth rainforests, the Tongass is the “crown jewel” of the National Forest System. Its pristine rivers produce more salmon than any other place on earth. The regional economy is tied to the health of this fishery and wildlife, which in turn, depends on how the Tongass rainforest is managed. Most of the productive forests are verdant old growth Sitka spruce and western hemlock, with ideal conditions for abundant salmon, deer, and other subsistence wildlife. But most of the largest trees were logged decades ago. 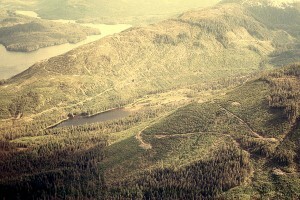 Industrial logging was slowed by landmark policy changes in the last quarter of the 20th century, including the Roadless Area Conservation Rule. But if Alaska Governor Sean Parnell has his way, the Tongass will return to the clearcut strategy of the past. The Governor recently announced that the State would challenge the Roadless Rule as it applies to the Tongass as well as a federal judge's recent decision overturning the Bush-era exemption to the rule in Southeast Alaska. In his announcement, Governor Parnell stated that, "this is the wrong time for the Forest Service to further restrict timber supply, new mining jobs and development, and impose higher energy costs on communities." He also wants to dam and mine the region’s salmon bearing streams and announced a “timber task force” that could lead to a return to unsustainable and damaging logging. The Governor’s myopic view of the life sustaining Tongass rainforest is at odds with the region’s sustainable economic drivers. Southeast Alaska employment is no longer dominated by natural resource extraction; rather, today’s jobs are in non-extraction services (44%, many in tourism), government (36%), leisure/hospitality (10%), commercial fishing and seafood processing (8%). The mining and wood products industries are dead last, each representing 1% of regional employment. The economic engines derived from old-growth rainforests, intact forest roadless areas, subsistence wildlife, and, especially salmon are what is driving the economy today and into the future. In trying to prop up the few jobs in logging and mining on the Tongass, the Governor would seriously harm other job sectors— especially Alaska's healthy salmon and trout populations that pump nearly $1 billion into the local economy every year. Cruise ships, local guides, and bush pilots are busy not because tourists come to see clearcuts, but because they come for fishing, wildlife viewing, sight seeing, and other rainforest amenities. We know from other regions, like the Pacific Northwest, that logging, road building, mining, and dams have together nearly devastated commercial and recreational fisheries. Fiscally the Governor’s proposals do not pencil out. According to the Forest Service, total revenues from all timber sales on the Tongass combined were $5.5 million from 2002-2008. During this time, the agency spent nearly $30 million of taxpayer dollars just on building timber sale roads. Far more was spent in planning and administering these sales. The road construction budget for one sale alone (e.g., Central Kupreanof) is $6 million. A University of Alaska study pegged the cost to the U.S. Treasury of each timber industry job in Southeast Alaska at over $170,000 annually. The Forest Service needs to transition its timber program into restoration, taking out and repairing damaging logging roads and culverts, and thinning overstocked post-clearcut forests. This type of management is not measured in board feet but in restoration jobs and healthy fish and wildlife populations, which in turn create local jobs in sustainable industries. American taxpayers do not want to foot the bill for the timber industry, but are likely willing to invest in restoring damaged fisheries because it is good for the region’s ecology and economy. The Roadless Rule protects 58.5 million acres of some of the most pristine areas in the nation, including the Tongass. Protecting intact rainforests is sound fiscal and environmental policy and an investment in the region’s future. The Governor’s tunnel vision would send the state down a too familiar dead end. Dominick A. DellaSala is chief scientist and president of the Geos Institute in Ashland, Oregon, and president of the North American section of the Society for Conservation Biology. He is the author of Temperate and Boreal Rainforests of the World: Ecology and Conservation. Randi Spivak is Vice President of Government Affairs, Geos Institute, Washington D.C, and is a national leader in efforts to protect National Forest roadless areas and old-growth forests. Both have worked on the Tongass and other rainforest regions for many years. Read this blog post translated into Estonian.